Buy Online Now! 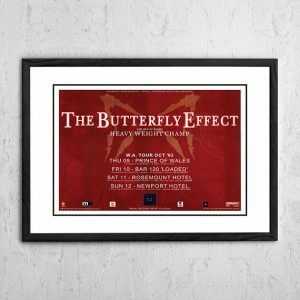 – Classic Butterfly Effect Concert Posters and Memorabilia. 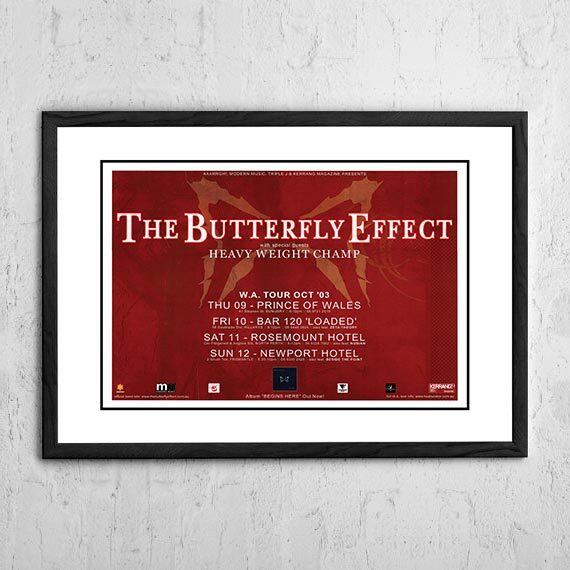 The Butterfly Effect is an alternative metal band from Brisbane formed in 1999. The band released a self-titled debut EP in 2001, and then three full-length album afterwards; Begins Here in 2003, Imago in 2006, and Final Conversation of Kings in 2008. During this time, the band consisted of Clint Boge on lead vocals, Kurt Goedhart on guitar, Glenn Esmond on bass, and Ben Hall on drums. After struggling for years to work on a fourth studio album, Boge left the band in 2012 due to personal and creative differences. The remaining members recruited Brisbane-based singer Paul Galagher for a final single and tour before announcing their breakup in 2016. In July 2017, the band announced their reunion as well as a headlining tour scheduled to take place in March 2018. We stock an some awesome Butterfly Effect print.